The Bible teaches us that salvation in Christ can be obtained in a moment, when one repents and receives Jesus Christ as personal Lord and Savior. This salvation is based on the merits of a crucified and risen Savior. However, salvation cannot be maintained apart from Christ. If we abide in Christ, the True Vine, we are saved. If we depart from the vine, we are not saved. If we depart from the vine, we will wither and die spiritually and make shipwreck of faith. Let’s allow the Word of God to teach us about the guaranteed salvation. NOTE: The word translated “castaway” in the Greek literally means “disqualified.” Paul did not teach a once saved, always saved doctrine. NOTE: Jesus promised eternal life to those who overcame. If you’re not an overcomer, then the promise is not for you. “For if we sin ________ after that we have received the knowledge of the truth, there remaineth no more sacrifice for sins, 27But a certain fearful looking for of judgment and fiery indignation, which shall devour the adversaries. 28He that despised Moses’ law died without mercy under two or three witnesses: 29Of how much ______ punishment, suppose ye, shall he be thought worthy, who hath trodden under foot the Son of God, and hath counted the blood of the covenant, wherewith he was sanctified, an unholy thing, and hath done despite unto the Spirit of grace? NOTE: This passage is not talking about unbelievers. It is talking about those who were sanctified. And the Bible teaches that the only way to be sanctified is to receive Christ. The idea that you are always saved because you were once saved is foreign to the Bible and is a dangerous doctrine of the devil. NOTE: ONLY those who obey are saved. If a person does not obey God, he/she WILL NOT be saved regardless of whether they bring a sacrifice or offers prayers. The Bible teaches that obedience trumps sacrifices. It tells us that “to obey is better than sacrifice,” (1 Sam. 15:22). Further, to claim to know God and refuse to do His will is to make Him a liar. This is because God made a covenant with His people. He said, “For this is the covenant that I will make with the house of Israel after those days, saith the Lord; I will put my laws into their mind, and write them in their hearts…” (Hebrews 8:10). 12. What are the things a person has to do in order not fall? (2 Peter 1:4-11). And beside this, giving all _________, add to your faith _______; and to virtue _________; 6And to knowledge ___________; and to temperance __________; and to patience __________; 7And to godliness brotherly _________; and to brotherly kindness _______. 8For if these things be in you, and abound, they make you that ye shall neither be barren nor unfruitful in the knowledge of our Lord Jesus Christ. NOTE: We had to “give diligence to make your calling and election sure” (v. 10). NOTE: It is a delusion of the devil to believe that “once saved always saved.” This verse destroys that possibility. According to Jesus, if you depart from Him, you not only wither, but you eventually are casted into the fire. 16. What did the Lord say would happen to a “righteous” man if he turns away from the righteousness and commits “iniquity”? (Ezekiel 18:24). “But when the righteous _________ away from his righteousness, and committeth iniquity, and doeth according to all the abominations that the wicked man doeth, shall he live? All his righteousness that he hath done shall ____ be _________: in his trespass that he hath trespassed, and in his sin that he hath sinned, in them shall he die. NOTE: The question of once saved always saved is directly asked and answered. The passage says that when the righteous take away and sin, the die! 18. Are you willing to abide in Christ, obeying His words until He comes again? 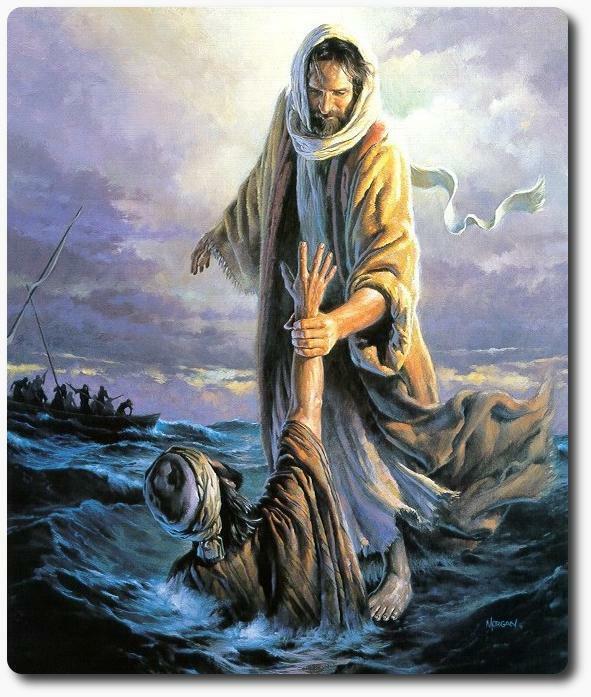 See Matthew 14:28-33 and discover that Peter was safe as long as he kept his eyes fixed on Jesus. We must do the same.